While the era of double-digit growth in healthcare costs seems to have ended, the "new normal" pace of around 6% to 7% a year is still unsustainable, according to a new study. PricewaterhouseCoopers Health Research Institute projected that medical costs in 2018 will increase by 6.5% from 2017. Insurers use the annual cost growth rate as a benchmark to help set premiums. While the medical cost trend has declined from 11.9% in 2007, it will still outpace economic growth, which means employers, providers and insurers must work together to reduce costs over time, the study found. HRI's analysis measures anticipated spending growth in the employer-based market, which covers about half of all Americans. The study did not factor in changes to government payers and ACA exchanges. It attributed increasing medical costs to rising general inflation, fewer employers turning to high-deductible health plans and fewer branded drugs coming off patent. Increased scrutiny on drug prices and better techniques for managing and deploying new treatments and technologies will prevent healthcare costs from returning to double-digit rates. "We really have had a slowing trend in medical costs over the last decade, which seems counterintuitive," said Ben Isgur, who leads PwC's research institute. "That being said, we don't want people to come away with the impression that we can raise a victory flag. Even with the new normal, we are outpacing general inflation by two to three times — it is completely unsustainable." The healthcare industry continues to shift toward paying for value, emphasizing care management and increasing cost sharing with consumers. A surge in high-deductible health plans and streamlining care to provide the right treatments at the right time have translated to a drop in utilization — helping slow the cost curve. The next step needs to focus on pricing, Isgur said. "We at an inflection point," he said. "That strategy that has reduced utilization may be running out." Researchers recommended that employers contract directly with providers to tackle healthcare prices without shifting more costs to employees. Employers should take a look at narrower provider networks and value-based purchasing that focus on bringing price, rather than utilization, down. And as providers take on more risk, they should focus on improving care management and the use mid-level staff like nurse practitioners to keep costs down. St. Louis-based Mercy directly contracts with the airplane manufacturer Boeing Co. It has been an effective way to hold down costs by removing costly middlemen, Mercy COO Michael McCurry said. "It is an effective way to mitigate the cost of healthcare," he said. "When we really focus on driving the right utilization, servicing the heck out of patients with chronic health problems and keeping them healthy and out of the hospital, it is the perfect trifecta — it drives costs down, service goes up and quality goes up. I think that is one of bright spots of the future, having a greater partnership with the people who are paying the bill." Health insurers should also work to steer patients to the most effective treatment options and help providers accelerate pricing transparency efforts, the study said. They should also explore value-based purchasing with pharmaceutical companies. Blue Shield of California has set up an Accountable Care Organization with the city and county of San Francisco, Dignity Health and Hill Physicians Medical Group that helped reduce costs by about $10 million a year. Since 2010, Blue Shield's 42 ACOs have reduced inpatient admissions and length of stay by 21% and 19%, respectively, said Susan Hallett, vice president of ACO performance and management at Blue Shield. "We can steer patients to the best treatments at the right place and right time," said Hallett, adding that Blue Shield embedded pharmacists in the ACO to help manage drug costs. "We work together to reduce average lengths of stays and general admissions because everyone has a stake in it." 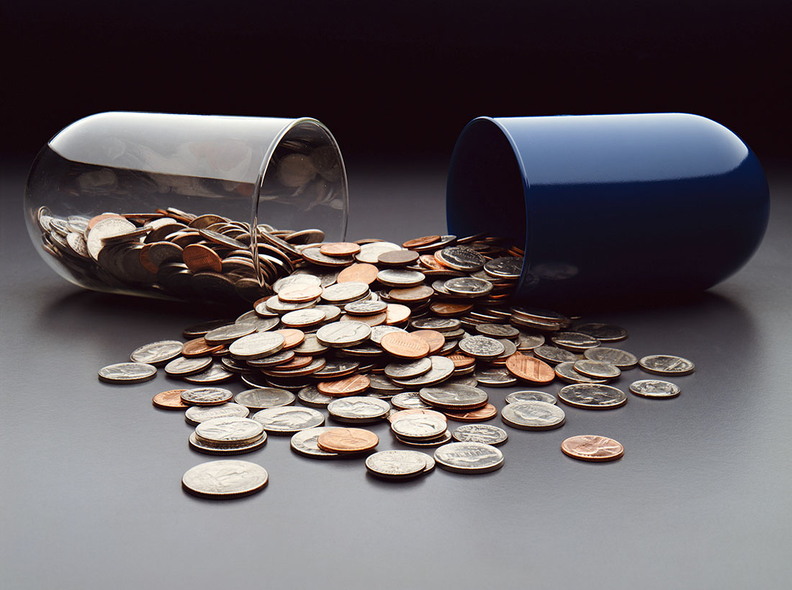 Drug companies should focus on increasing collaboration across the industry to give stakeholders a clearer view into their pricing, researchers said. The rising price of specialty pharmaceuticals is a top driver of healthcare costs, said Steve Wojcik, vice president of public policy at National Business Group on Health. "It is something that is going to be of continuing concern because there is not a lot of robust competition in the market for specialty or biological drugs that are harder to produce," he said. Branded drugs with no generic alternatives, or single-source drugs, are the main culprit of pharmaceutical spending increases, research shows. There are a handful of bills aimed at increasing competition by streamlining generic drug developer's path to market catalyzed by a public outcry that followed massive drug price hikes. As the public and political scrutiny mounts, drug companies will become more price cautious, researchers said. "Regardless of what comes out from Congress or the administration on drug prices, there is already going to be a halo effect of downward pricing pressure from public scrutiny," Isgur said.